Extra Seedy Granola for sale. Buy online at Zingerman's Mail Order. Gourmet Gifts. Food Gifts. 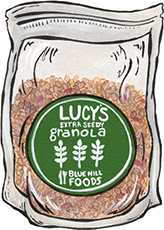 Our purchasing manager, Joe Capuano, has been enjoying Lucy’s granola for years. Every summer he vacations in Maine and a few years back he discovered Lucy and her delicious granola at a farmer’s market. They struck a friendship (“that’ll happen when you order a case every few months,” he says) and visiting Lucy at her kitchen became a yearly event. Still, Joe’s not a pushy man, so he didn’t bring this up to me. After finally tasting one of the bags he brought into the office, I wish he had. Lucy is one of those inspired chefs who are proving there’s more to granola than just hippie good will: it can really taste good, too. Her extra seedy variety is nutty, not too sweet and generally rather light for a granola. Sweetened with honey and maple syrup from a local farm it’s one of the better-balanced granolas you’ll find on any store shelf. Powered by pumpkin seeds, sunflower seeds, coconut, almonds, oats and more, it’s a great way to start the day in a bowl with milk or, like a true tree hugger, mixed with yogurt.